Adela Akers: Textiles of Ancient Peru and Their Techniques by Raoul D’harcourt (Univ of Washington Press, 1974; Dover Publications, 2002). I discovered this book in the Public Library in Chicago around 1958. It was a reference book and only in French. Later it was translated in English, and a few years later it was reprinted. Wonderful examples, history and diagrams; there’s nothing like it. It was like my bible. Not sure if it still available. There are many other books on Philosophy and Architecture that I would recommend, but the D’harcourt book was the most influential. Randy Walker: There are many books that have inspired me. Here are two: Mark Tobey published by the Museo Nacional Centro de Arte Reina Sofia, 1997. The intricate, two-dimensional paintings of Mark Tobey give me a continued faith in the inexhaustible potential of delicate lines to create rich, three-dimensional spaces. A bounding framework, filaments, color and light can provide a lifetime of artistic exploration. This book is one of my most coveted possessions. Also, The Book of Looms: A History of the Handloom from Ancient Times to the Present by Eric Broudy( Littlehampton Book Services Ltd., 1979; Published by the University Press of New England, 1993). This book is absolutely fascinating from a visual, historical, and technical point of view. The forms of looms have inspired me as sculptural elements in themselves. Understanding the evolution of their forms in a cultural context is invaluable. I have to imagine this book of interest to non-fiber people as well as serious fiber artists. Mary Giles: Agnes Martin: Writings , ed. Dieter Schwarz (Hatje Cantz Publishers; Bilingual edition 2005). Agnes talked about waiting for inspiration… and waiting…and waiting…and waiting. She also spoke of not having unnecessary distractions in your life such as pets and unnecessary friends. I put my husband and the two cats up for adoption but so far no takers. Lia Cook: On Being Certain: Believing You Are Right Even When You’re Not , by Robert A Burton, M.D. (Reprint edition, St. Martin’s Griffin, 2009) is a book I have read recently that I think will be influential going forward. I am interested in emotional responses to visual perception of handwoven works. It is perhaps tangential to my main focus but nevertheless important to the research process. Glen Kaufman: One book I recall reading when i was working in ceramics prior to fiber was A Potters Book by Bernard Leach (Faber & Faber 1988). Nancy Moore Bess: How to Wrap Five Eggs: Traditional Japanese Packaging (and all of its variations)(recent reprint, Weatherhill, 2008) had a HUGE influence on my work. The Japanese have a wonderful way of using indigenous materials to wrap things…packaging, transporting, presenting. Even now, years later, the influence of these old techniques prevails. This book and its information, not basketry nor bamboo, drove me to Japan in the first place. Who knew it would have such a profound influence on my work? If you look at some of the earlier work I exhibited through browngrotta arts, you’ll see Japanese packaging everywhere. In New York, the recent reprint can be found in Kinokuniya Bookstore on 6th Avenue. Love that place! Lena McGrath Welker: Buddha Mind in Contemporary Art (University of California Press, 2004) is the absolute cornerstone of the project I have worked on for six years for the North Dakota Museum of Art. The book contains a series of papers and artist interviews that resulted from a year-long project all up and down the west coast (why not Portland???) in which Jacquelynn Bass and independent curator Mary Jane Jacobs looked at how curators shy away (to say the least) from work that has anything to do with spirituality. There were several retreats at a Zen Center in California, where papers on the topic were delivered. There’s more information about the project on the UC Press website. As to pursuing a career, I never really did that. I do what I do because I have to. It is what keeps me in the world. Ethel Stein: Josef Albers: To Open Eyes by Frederick A. Horowitz and Brenda Danilowitz (Phaidon Press, 2009) It’s an account of Albers’ teaching at the Bauhaus, Black Mountain College and Yale. I took a summer course with him at Harvard when I lived in Cambridge and this book sums up some of the thing he had us do. It was very exciting. My day job is in publishing, and thanks to browngrotta arts’ catalog publishing program, my night job is too. We’ve got books and papers everywhere. My rules for 2010: No pile of papers, books or magazines may grow taller than two feet and there may not be more than six piles (that are mine) in the house at one time. That’s 12 feet of reading for next year. You’d think that would be enough, but maybe not. So, I asked artists whose work browngrotta arts represents for book recommendations. Specifically: “Is there a book that has had a particular influence on your work or decision to pursue art as a career?” Here’s the first installment of their thoughtful replies: Gyöngy Laky: It is difficult for me to think of a particular book that launched me into what I am doing today…there have been many and it was long ago that I set out on this path in art! But, there is one general art history book that I bought as a young person when I spent a year studying art and French in Paris in 1963-64! And, funny enough… it was titled The Loom of Art by Germain Bazin, curator of the Louvre (Simon Schuster, NY, 1962) probably way out of print! The book is beautiful and I have it and love it still. More recently my friend, who is a builder, designer, wood collector extraordinaire, Paul Discoe, put out a book on his work, Zen Architecture: The Building Process as Practice (with Alexandra Quinn, Gibbs Smith, 2008). It is a wonderful book. He collects street trees and mills them and uses them in his work so he is dear to my heart. Another book, for children, but adults love it too is If… (Getty Trust Publications : J. Paul Getty Museum) IF (Getty Publications; J. Paul Getty Museum; First Edition edition 1995) by another artist friend of mine, Sarah Perry. And, of course, I love and am inspired by Martin Puryear (The Museum of Modern Art, New York 2007) by John Elderfield, Elizabeth Reede, Richard Powell, Michael Auping, Martin Puryear. Scott Rothstein: Here is one I love: Lucie Rie by Tony Birks (Marston House 1994). I feel this book documents her work very well. I am always amazed at the “drawing” she could do with glaze. Kay Sekimachi: Yes, there is a book. 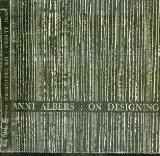 Anni Albers: On Designing (Wesleyan 1971). It was my weaving “Bible”. In fact everything she wrote makes so much sense to me. Nancy Koenigsberg: I have worked as an artist – painter, rug designer, knitter – for many years, but when I read Beyond Craft: The Art Fabric: Mainstream by Mildred Constantine/Jack Larsen (Van Nostrand Reinhold 1972) it just turned my ideas and work upside down. I saw what was possible with the materials I was using and what else was out there. That book opened up a whole new world to me. Mary Merkel-Hess: Your question has set me thinking about exactly why I did choose art as a career. I think, actually, the desire originated in the ethnographic collection of the Milwaukee Public Museum where I whiled away hours between classes looking at objects from South America, Africa and Europe. But, back to your question. A book that is much on my mind just recently is The Unknown Craftsman: A Japanese Insight into Beauty by Soetsu Yanagi (Kodansha International, Revised edition, 1990). One of my first trips after arriving in Tokyo three weeks ago was to the Mingeikan, Yanagi’s museum and home. It was a delight, after so many years, to see some of the work pictured in the book. Yanagi’s theory that hard, repetitive practice resulted eventually in the disengagement of self and led to work of merit produced with ease was an inspiration to me. I was a young grad student when I first read the book and at the time every day was a struggle. Kate Hunt: The Savage Mind (Nature of Human Society) by Claude Levi-Strauss (University Of Chicago Press, 1968). The introduction made me think about the role of an artist and about materials.